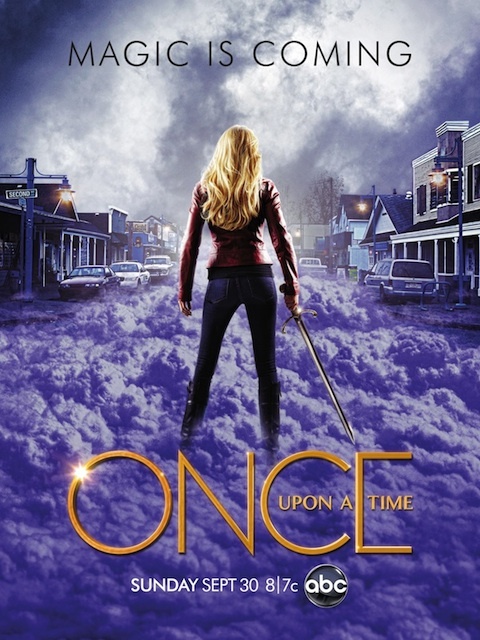 The new key art for the approaching second season of ABC's storybook fantasy drama Once Upon a Time has Emma Swan posed as the hero, sword in hand. But danger is afoot… literally! Check out the new poster for Season 2 ahead! TVLine says fans chose this key art via Facebook for Season 2. The first season's close had a cloud of purple smoke engulfing Storybrooke, the town where all of the storybook characters have been banished by the evil queen. The smoke is back in this new poster! It gives us a look at Emma Swan from behind, wearing her signature leather jacket, her hair down (and looking typically perfect - am I the only one that thinks Emma's perfect, exceptionally-glamorous hair is a little inconsistent with the character?). She's clutching a sword and posed in a way that has me convinced she's staring down that purple smoke and ready to fight it and everything else that's willing to face off with her. Once Upon a Time Season 2 premieres Sunday, September 30 at 8/7c on ABC.